Seems the good ol' days are coming back in a whole new way. Up until roughly the 80's comics addressed global issues, often in fund-raising or free comics designed to make readers aware of the situation. Many of those books are free for you to read right here. 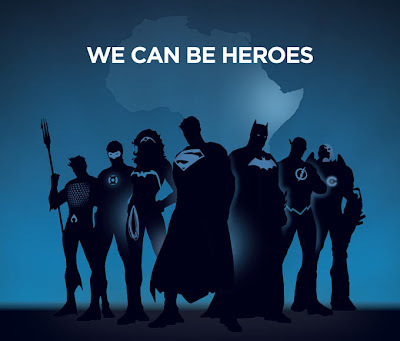 Today however, DC Entertainment not just dove, but summersaulted and double back-flipped into the game, away from the now insular world of comics, launching WeCanBeHeroes, a fund-raising initiative using the company's biggest global icons to fight the biggest global problem; drought and famine in the Horn of Africa. Raising awareness, the two-year campaign will see DC match fan donations made at the central website dollar for dollar (up to one million dollars). Add to that branded merchandise were 50% goes to the crisis, an online community and updates on the African crisis and you have one hell of an online hero in itself. Backed by parent company Warner Bros, the fund-raising drive will support selected partners Save the Children, International Rescue Committee and Mercy Corps, as they tackle a region suffering its worst drought and famine in over 60 years, with 13 million in need of critical assistance and 250,000 facing starvation in Somalia alone. Excellent post Dan. Thanks for letting me know. It's kinda nice to see the comic book industry going back to lending a hand. Thanks Random! I reckon it is to. Plus the tshirts look pretty cool, I might even get one of those to sport around to. people helping people. Theres nothing better. Way to go Dan. Thanks OA. I agree, its a really great move on DCs part. And to match the contributions... Well thats to cool for school.